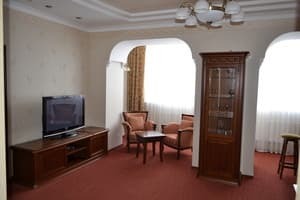 Hotel Mir is located in Severodonetsk, 800 meters from the bus station. The hotel has 124 rooms of different categories. Rooms are equipped with double or single beds, TV, free Wi-Fi internet access. Some rooms have a fridge, air conditioning. The price includes breakfast. There is a restaurant on site. For conferences there is a conference room. There is also a bar, bowling, tennis court, sauna, solarium and parking for cars (guarded). The distance from the hotel "Mir" to the city of Kiev is 687 km, to Lugansk - 87 km. Description of the room: In number double or two separate beds. Description of the room: Room with double or twin beds. Description of the room: The hotel has two-bedroom and three-bedroom apartments (specify when booking). Функциональные довольно просторные номера. Отличная кухня! Additional seats are not available (paid service). The price includes breakfast. There is a restaurant on site. 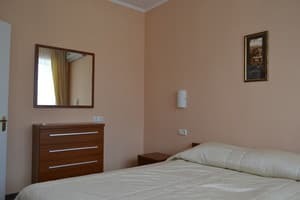 Hotel Mir is located in Severodonetsk, 800 meters from the bus station. The distance from the hotel "Mir" to the city of Kiev is 687 km, to Lugansk - 87 km. From Lugansk can be reached by bus to the hotel. From Kiev you can also take a bus.